See, pineapples can be pretty pricey, but they always drop to an all-time low in January. In the past, I’ve picked them up for a dollar at Aldi. This year they jumped in price. A lot. The one I got was $1.29. I actually ran into Aldi to pick up one thing after a therapy appointment, so of course I didn’t have a bag or a cart when I spotted the pineapples. I came out clutching said pineapple to my chest. I caught myself on my camera at home and gotta admit I looked a little crazed. I think you’ll find the few Pineapple recipes (follow the tag for Pineapple on the bottom of the page) on my site usually happen late December when the prices start to drop up to very early February…that’s because I love fresh pineapple and that’s when it’s cheapest. I didn’t even know I liked pineapple until I left Iowa in the ’70s and had fresh for the first time! 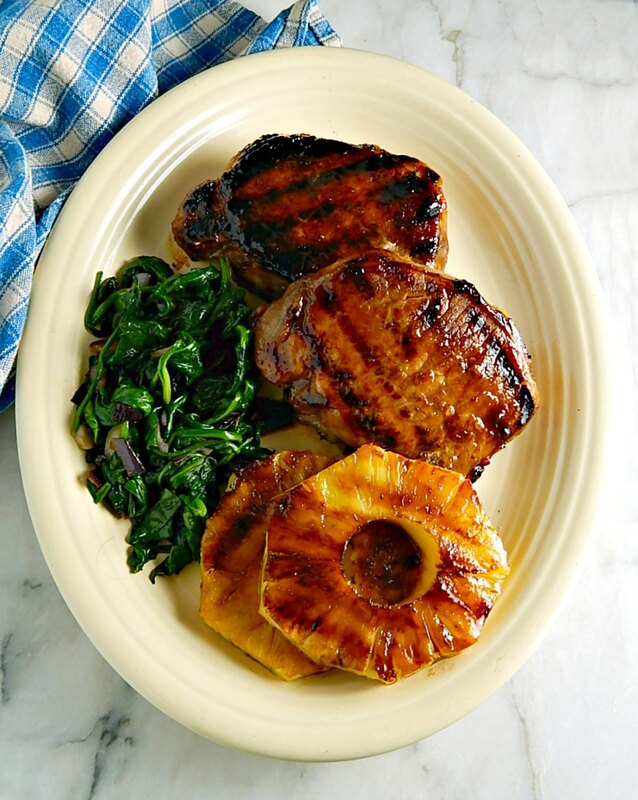 So if you can swing it, that’s the way to go on these Grilled Hawaiian Pineapple Pork Chops. It’s the star of the show, here! I gotta admit that the pork chops ain’t too bad, either. The chops are brined so they’re lovely and about as moist as a center cut loin chop can be. That ups the flavor, too, and that brine does double duty as a crazy good sweet/sour sauce seared into the pork chops as they grill. We served Grilled Hawaiian Pineapple Pork Chops with Mashed Sweet Potatoes and Sauteed Spinach. (Kraig & Tweety were here and helped shovel that 7 inches of snow we had the other day.) The chops would be great with my Stupid Simple Crispy Sweet Potato Fries. Rice or a rice pilaf might be a better choice as a side than the sweet potatoes and carry through the roughly Hawaiian or Pan-Asian theme of the meal. I’ve been (kinda) trying to avoid some of the carbs, especially ones that don’t deliver as many nutrients and/or fiber. Although I did make my Crusty Bread the other day. I was in heaven! I’ve been telling ya I’m all about simple, these days, and thanks to a combo of soy sauce, brown sugar, and salad dressing, yep, salad dressing, this has got to be one of the simplest recipes ever. I decided to dump in some of my Orange Balsamic Vinaigrette as a fruity, garlicky component to the marinade. It’s not a wimpy dressing and pretty robust with all that garlic and that meant no fussy garlic peeling and chopping (I really do need a jar of it to get me by) or extra ingredients like citrus, oil or vinegar. If you don’t want to make the vinaigrette, just use a bottled white Balsamic or Italian dressing from the store. Get something with big flavor. Because I used fresh pineapple, I didn’t have any juice to add to the brine except a smidge I rescued from my cutting board…that’s part of the reason I chose the Orange Balsamic Vinaigrette because it does have all that citrus fruity flavor. If you use canned pineapple rings, feel free to splash in a little of the juice it’s packed in. Because the brine is boiled and reduced as the chops grill a little extra liquid won’t hurt a thing. If you wish and are comfortable with it, you can separate out some of the reduced brine as a sauce and only use part of it to brush the pork chops, but they’re crazy good just as is. We just used our indoor grill for these chops, given the conditions outside. I know even 23 F below won’t deter some people but I can’t get the propane to heat enough to counteract the temperature once it’s down to the 30’s even if I were willing to give it a go! I have a love-hate affair with my Cuisinart Griddler. Love it for paninis, hate that it barely heats enough for a good sear. When it gives out, I’ll just get a cast iron grill pan. The sticky sweet sauce aided those grill marks, though. We’re just not so much about eating larger portions of meat these days as the centerpiece of the meal. In this case, Kraig and his g/f Tweety were over and we split two of these chops between us, cutting them into slices across the grain. The recipe is so versatile that you can make just two as we did, go with 4 as the recipe states or make as many as you need – increase the marinade a little if you need to. When I do pork chops, I buy a large pork loin roast when they are on sale and (sharpen your knife, first) cut into thicknesses my family will use. Some thicker, some thinner, and divide into Ziplocs and freeze. Any scrappy pieces or bits go into a package labeled for stir-fry. The larger loins drop down to $1.99 a pound regularly and on a great special, $1.49 a pound, a considerable saving over buying chops at the store. A brine always helps pork chops, even the drier loin. If savings isn’t an issue, a great bone-in chop is even better in this recipe. I already talked about that pineapple, and I used my homemade Orange Balsamic Vinaigrette and talked about that pricing on that post. Homemade is almost always cheaper (and so much better and better for you) than bottled unless you’re a great coupon shopper & then all bets are off. Brown sugar can be substituted with the same amount of white and a teaspoon or two of molasses. You can see my post about Homemade Brown Sugar for more info. Soy sauce and any Asian ingredients are best bought at an Asain market if you have one or during the Lunar New Year which varies every year when they are often on unadvertised special. In a large Ziploc, mix together brown sugar, dressing, soy sauce, and red pepper flakes. Massage to blend. Add pork chops and seal bag, squeezing as much air out as possible, squishing the chops around to make sure all are coated. Place in a container and refrigerate 2 to 24 hours, the longer the better. Turn now and then if you’re around. To grill, fill a large chimney starter with charcoal and light. Once the charcoal is ashy and white, approximately 30 minutes, dump the hot charcoal onto the lower grate and spread into an even layer. Return the upper grate, cover the grill and heat for about 2 to 3 minutes. Alternatively, heat gas grill to medium-high, covered. Place pork chops in the center of grate. Brush tops of pork chops with glaze. Cook until grill marks show on the bottom, then turn chops over, placing on a fresh area of the grate. Brush the bottoms (now the top) of the pork chops. When the downside of the chops shows grill marks, turn at a 45-degree angle, placing again, on a fresh area of the grill. When marked with the cross hatch, turn the chops over again, again placing on a fresh area of the grill, at a 45-degree angle to the first marks. Continue to cook, glazing as desired, until the chops reach an internal temperature 145 (pink in the middle) to 160 degrees F. If chops are darkening too fast, place on a cooler area of the grill or reduce the heat. Remove from heat and keep warm. Place pineapple slices on grill. Baste pineapple with reserved marinade. Grill one to two minutes on each side or until browned. Place a pineapple slice on each chop. Canned pineapple may be very delicate. Use care. place chops on grill, brush tops with glaze. Timing is shorter if using an indoor grill. If you are not comfortable removing and reusing the marinade, make a little extra and divide it, using some as a marinade with the pork chops, and saving some for the glaze and the sauce. I’ll be sharing Grilled Hawaiian Pineapple Pork Chops at Fiesta Friday #261 co-hosted this week by Antonia @ Zoale.com and Julianna @ Foodie on Board. Stop by and visit Fiesta Friday and see what wonderful recipes have been posted this week. This entry was posted in Click here for Bargain Meals, Click here for Fabulous Food Posts and tagged Bargain Meal of the Week, Hawaiian, Pork, pork chops, Pork Loin, Salad Dressings. Bookmark the permalink. The recipe states the yield is 1 cup, not the number of pork chops. What is the number of pork chops from this recipe? I beg your pardon! The recipe calls for four chops; I’ll change the yield! And I forgot to say, thanks for the catch on that! Hi this is Kristina visiting from Fiesta Friday. Oh, these look so good! I’ve never grilled pineapple before but I’v always wanted to try it. Hi Kristina! Thanks for stopping by – grilled pineapple is marvelous because it softens and gets so juicy and then it slightly caramelizes and it’s kind of amazing! 🙂 Do it, lol!! Wow, that’s some cold weather! I have a friend that was just up your way and she said that 7 degrees felt marvelous after being below 0. Stay warm! I love the glaze on this! Thank you for bringing your delicious and flavor packed meal to the party! Happy Fiesta Friday! Hi Antonia, thanks! Luckily it’s not so bad most of the time, but we warmed up to high 30’s over the weekend and a lot of the seven inches of snow we got last week melted, then everything froze over so it’s pure ice everywhere, now it’s snowing again (monday) It’s just crazy. I don’t know whether to be grateful for those two nice days or not!! Grilled any kind of fruit is the way to my heart! Back atcha Gail!! I know you’re fan of anything Hawaiian! Missed your comment right away, Debbie! I hope you’re tucked in all cozy! Another non fan I take it!! Like grilled pineapple with meat – such flavors. Pork Chops Pineapple – yum!!! LOL! I’m just ignoring you…except for the sundae topping! Although I’d rather have hot fudge, chocolate sauce or salted caramel! Fruit toppings on ice cream are a nice change up from the usual chocolate or fudge ones. I haven’t made any pineapple fish dishes but I can see tropical with fish, for sure!